Need new wholesale fire department patches? WholesalePatches.com is your one-stop, no-problem source for great patches, great prices and great service! Now you can get wholesale patches no matter your budget! Our top-quality materials and artwork, combined with our rigorous quality control means your custom patches will be the best available. As far as price goes, we won’t be undersold, so you can get great custom patches, regardless of the size of your budget! We’re dedicated to providing the finest quality wholesale fire department patches at unbeatable prices. Our graphic artists can help you create a new patch, or reproduce your existing one, to create new patches your firefighters can wear with pride. We offer a full range of size, shape and backing options to ensure your patches are right for your exact needs. 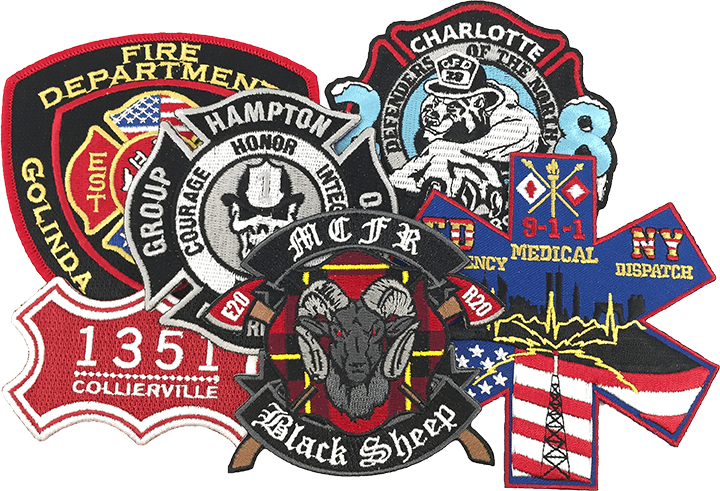 We use only the highest quality embroidery thread and twill backing available, so you can be assured your wholesale fire department patches will stand up to the toughest environments you’ll encounter. We inspect each patch before we ship it to you. And we stand behind everything we sell with our 100% Satisfaction Guarantee. If you find any patch to be defective in either workmanship or materials, let us know, and we will replace it at no additional cost to you.